(Newser) – Troops headed for the US-Mexico border aren't just aiming to help prevent migrant entry—they have unregulated militias and criminal organizations on their minds, too. According to planning documents obtained by Newsweek, the Department of Defense is aware of nearly 200 armed militias already operating along the southwest border. 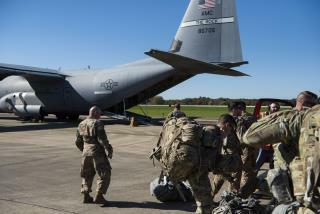 "Reported incidents of unregulated militias stealing National Guard equipment during deployments," reads an intelligence assessment for the Pentagon by the Joint Force Land Component Commander Threat Working Group. "They operate under the guise of citizen patrols supporting CBP [Customs and Border Protection] primarily between POEs [Points of Entry]." The documents analyze four points of entry including one in Brownsville, Texas, and another in the San Ysidro district of San Diego, Calif. The insane drama-spending sprees of ConJob Don have to stop. The idea of sending 15,000 troops to the southern border when 150 is not even necessary... total BS and proof how dangerously reckless Trump is within the US presidency. A couple surveillance drones and some extra border control agents is all that is needed to control the border under any circumstances. Anybody who wants a wall... or wants to feed, house and maintain 15,000 troops to observe a southern border, you're acting stupid and it should only be your money paying for it. (clipped) The drones are equipped with a range of instruments, including infrared sensors and satellite communications systems. The RQ-4 Global Hawk, the biggest drone in the U.S. Air Force fleet, is capable of surveying 40,000 square miles of ground in one day. Much cheaper just to warn them that their criminal activity will result in the getting shot. Then if they cross take them out. You can not pick and choose what laws you want to abide by, that is for citizens, illegals have no rights in our country. Trump is spending a $100 million of our money to move troops around to drive the hysteria he wants before the midterms because he is desperate, despicable and pathetic liar.